Because nothing else made sense. After almost being suckered by a vanity publisher – I did my research and discovered that the world of book publishing is now completely different to how I, and most of us, conceptualise it. You no longer need an agent or a publisher to get a book published. You probably need an editor, a graphic designer and a printer – all of whom are for hire for a modest price. You might need a publisher to help you market your book. However, no literary agent or traditional publisher will take a risk on a first time author (like me), unless they’re famous, have a staggeringly original work or have friends and influence – none of those predicates applied to me. I was actually offered two publishing contracts (from vanity-publishers), but it was clear that neither were going to put any effort behind marketing the book, yet wanted me to contribute to the production costs, sign over most of the royalties and, more importantly, relinquish editorial control. So, I found a great editor, a great designer and a great print-on-demand provider. The marketing is down to me – and here I’m doing it! 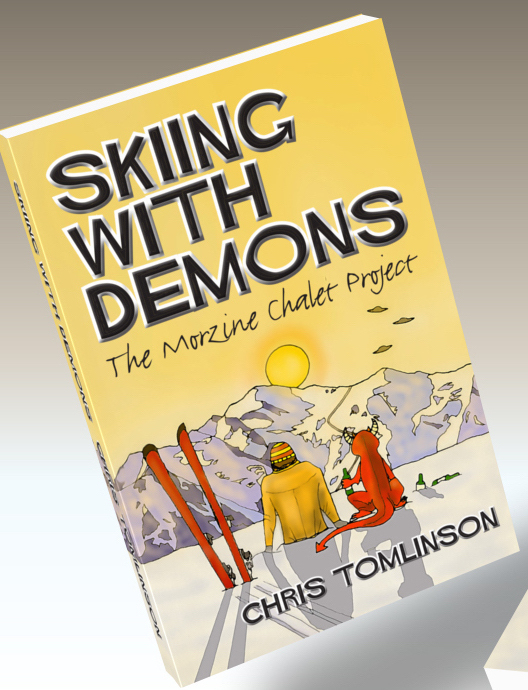 This entry was posted in Uncategorized and tagged Apres Aliens, divorce, drinking, midlife crisis, Morzine, morzine chalet, powder hound, ski demons, skiing books. Bookmark the permalink. 2 Responses to Why Self-Publish ? That’s so awesome! I’m going to SP my first book, too. What steps did you take? Hi Kristen – use these guys http://www.youcaxton.co.uk to help. Avoid Vanity publishers.